Nakhon Pathom Rajabhat University is a higher education institute providing development of localities and Thai society, as well as being a resource of knowledge for the general public. It aims to provide a balanced education for the development of decent and valuable individuals who will then manage intelligence and technology with skill and who will also contribute to the assimilation of knowledge so as to benefit both local people and the general public. In the academic year 2004, Nakhon Pathom Rajabhat University accepted 7,382 students in regular / full-time classes, 5,197 students in Kaw-Saw-Phaw-Pow / part-time classes, 206 community leader students, 182 Master’s Degree Students, 93 students in the Certificate (Graduate) of Teaching Profession, 488 students in the demonstration secondary school and 46 children in the kindergarten. The joint program, in cooperation with Samuthsakorn Physical Education College, accepted 138 students in regular / full time classes and 173 students in Kaw-Saw-Phaw-Paw / part-time classes. The University also employed 211 official government instructors, 16 civil-service officials, 177 employed instructors, 41 permanent employees and 188 temporary employees. 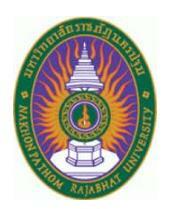 By the year 2006, Nakhon Pathom Rajabhat University will be a Higher education institute excelling in the fields of management and administration, applied sciences and teacher development, with the capacity of recruiting to the institute resources from within and without the Nakhon Pathom region. It will be an educational community of high standards upon which the local people can rely. To increase the capacities and strength of the local community.